Fall is definitely in the air here in the Canadian Prairies and already they had snow in the mountains over the weekend. 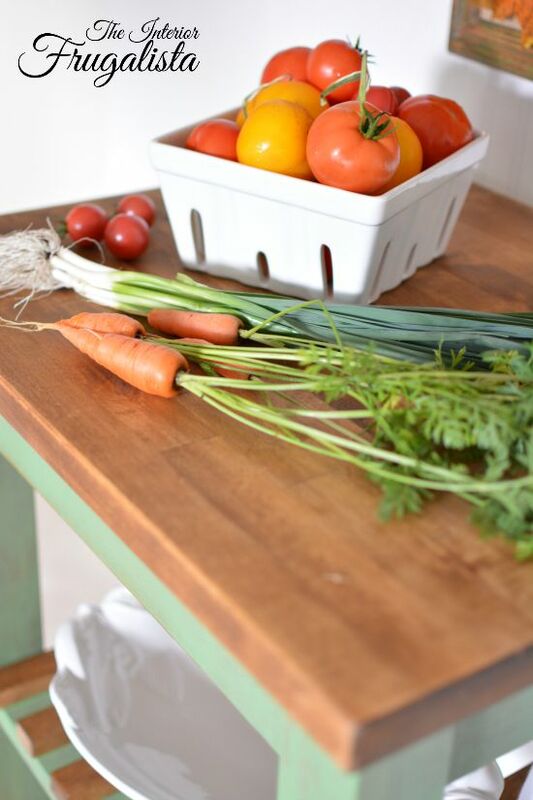 This cool weather has me thinking about harvested vegetables, pots of homemade stew and apple pie. 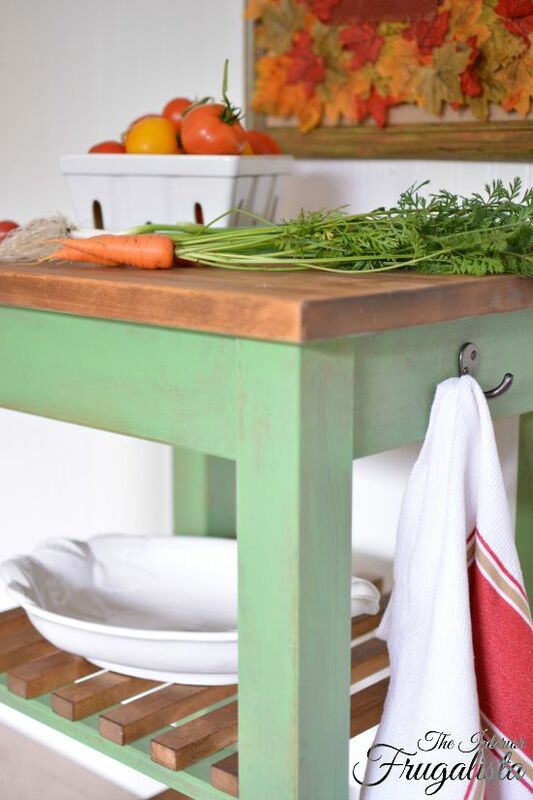 If you're like me and have a small kitchen and little counter space, what better way to add more food prep surface than with a small portable rolling cart. 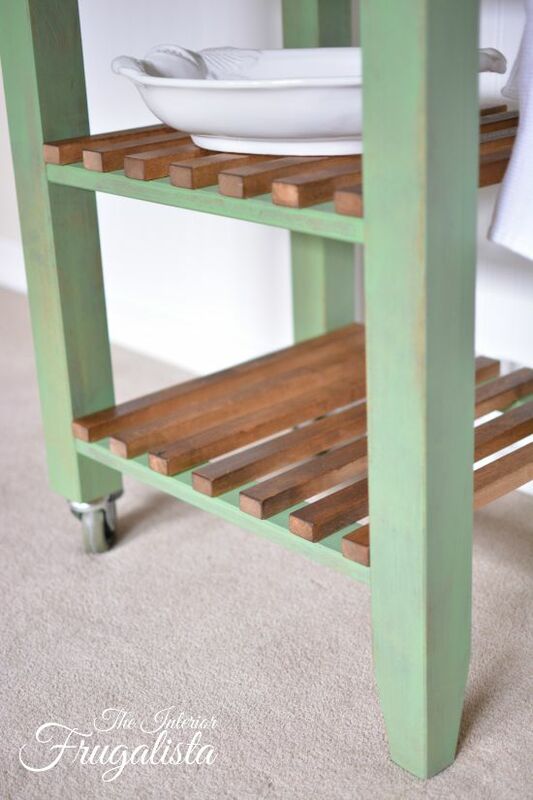 Today I'm showing you how I gave a used IKEA Bekvam Cart a makeover with Farmhouse charm that can be rolled out of the way when not in use. 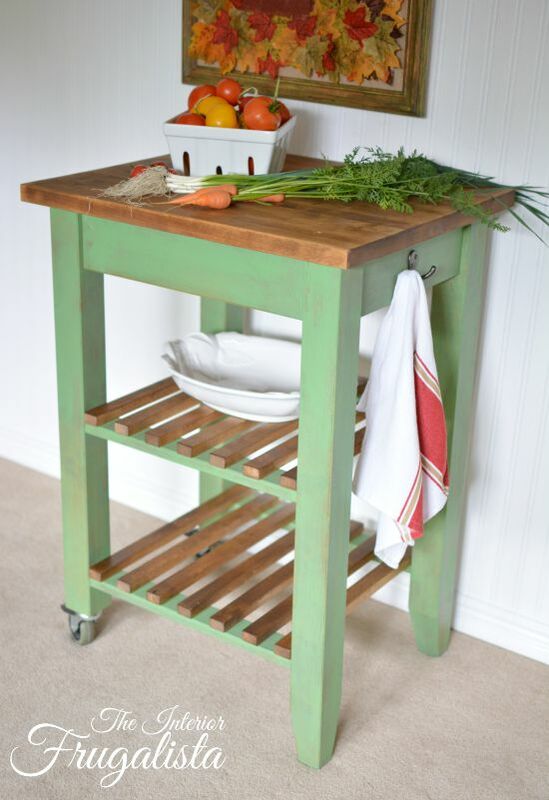 While it lacked any personality it's a solid wood cart with handy locking casters, making it the perfect portable cart for a small kitchen. This post includes affiliate links so you can find the products I used or recommend for this project. What that means is if you click on one of the links and make a purchase, I may receive a small commission, which helps support the costs of running this site. See my full disclosure policy. The first thing I did was remove the wood slats on the shelves and sanded them using a mouse sander. Next, using a chip brush I treated each slat with Hemp Oil. Hemp Oil is a food safe product which is perfect to use on butcher block counters, cutting boards, and wooden spoons. 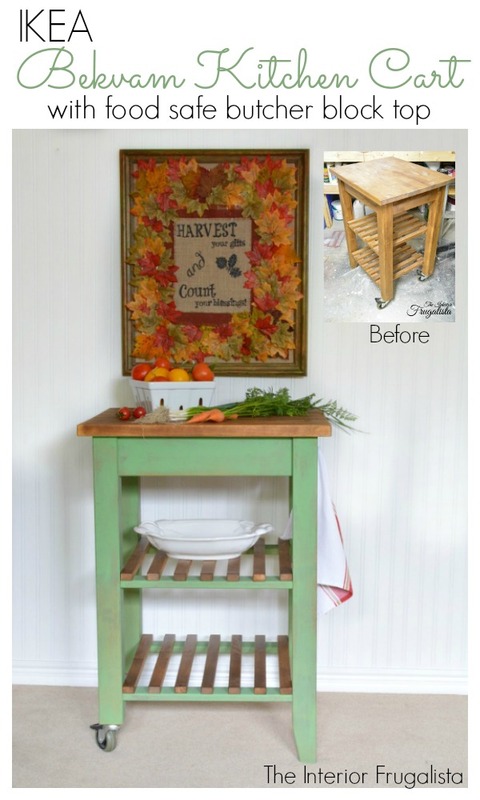 It worked beautifully to restore the luster to the wood top and wooden slats of the kitchen cart. 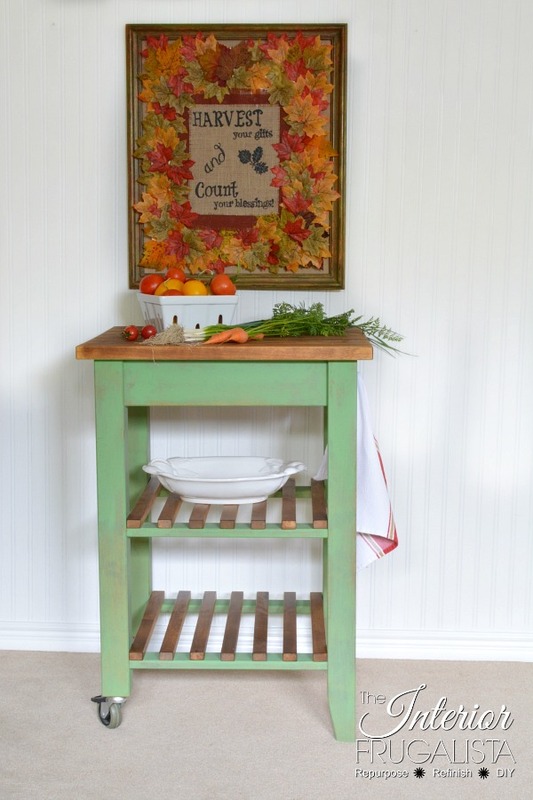 To add some charm, I dry brushed a light coat of chalk paint in the color Rustic Charm by Country Chic Paint in long random strokes so the wood underneath could still be seen. 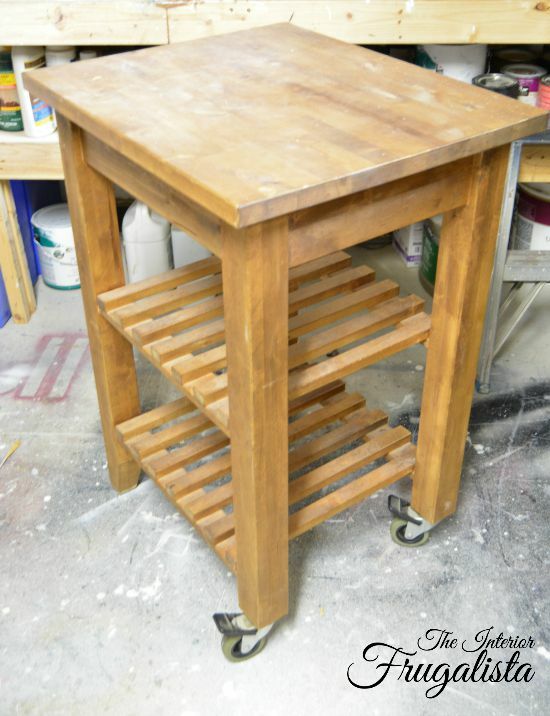 Rustic Charm pairs beautifully with light colored wood and using 220 grit sandpaper, I distressed some of the paint for more of the wood to show through. Did you know hemp oil can also be used as a protective finish? If you used a porous paint like milk or chalk paint, it absorbs into the paint and provides a beautiful matte protective finish. Apply it with a rag or chip brush, let it absorb into the paint for several minutes and away the excess. 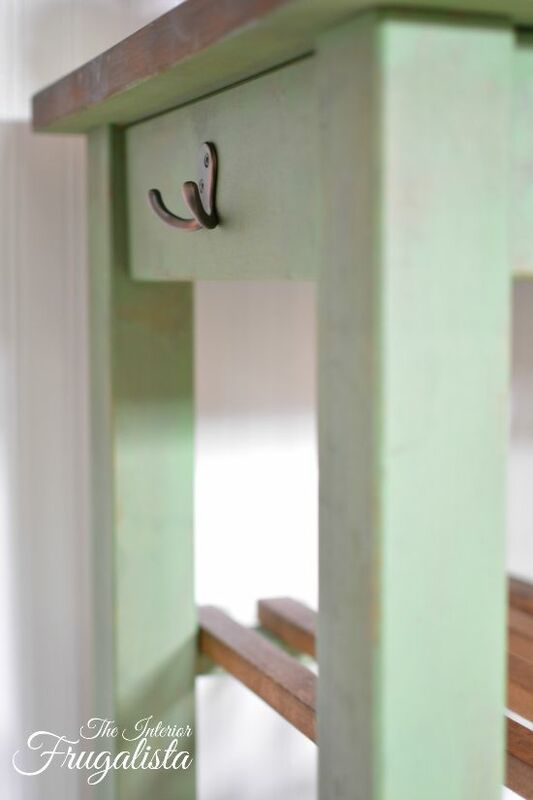 I added a couple of bronze hooks for hanging dish towels or oven mitts on each side of the cart. 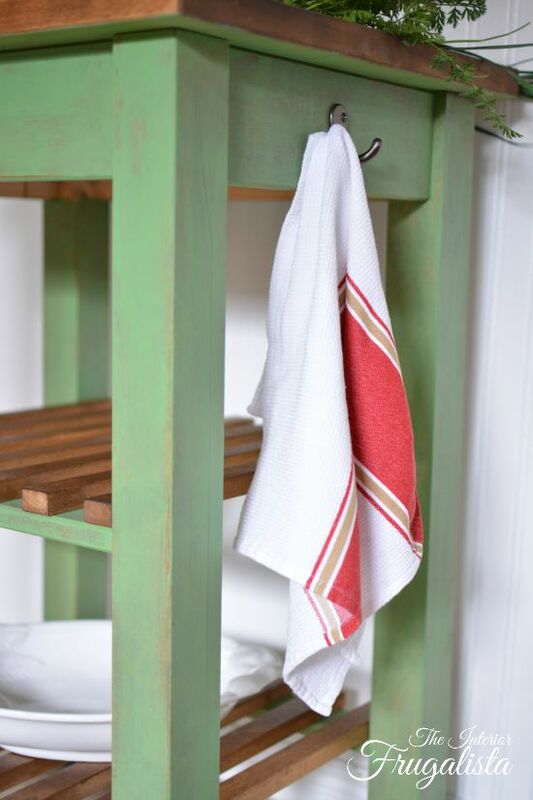 I staged the island with new linen grain sack dish towels because there was no way you guys were going to see my stained, torn and tatty well-used oven mitts. 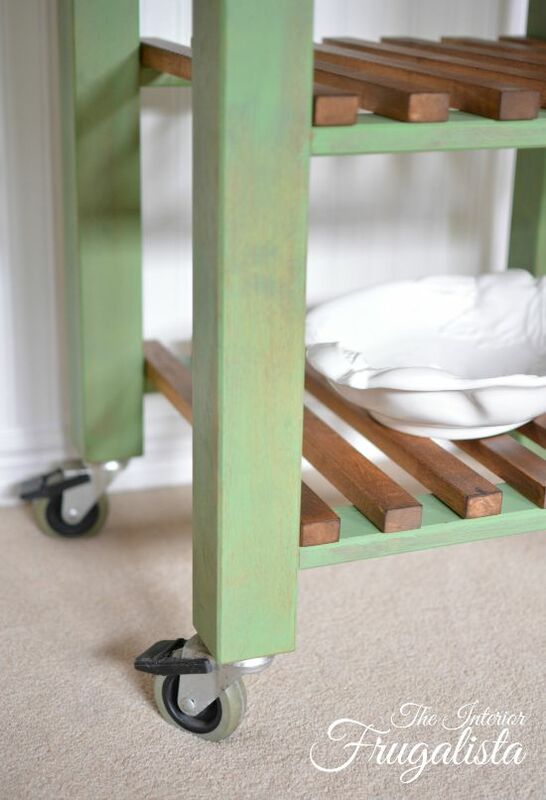 The casters offer portability to the cart so it could be used in any room and for multiple purposes. 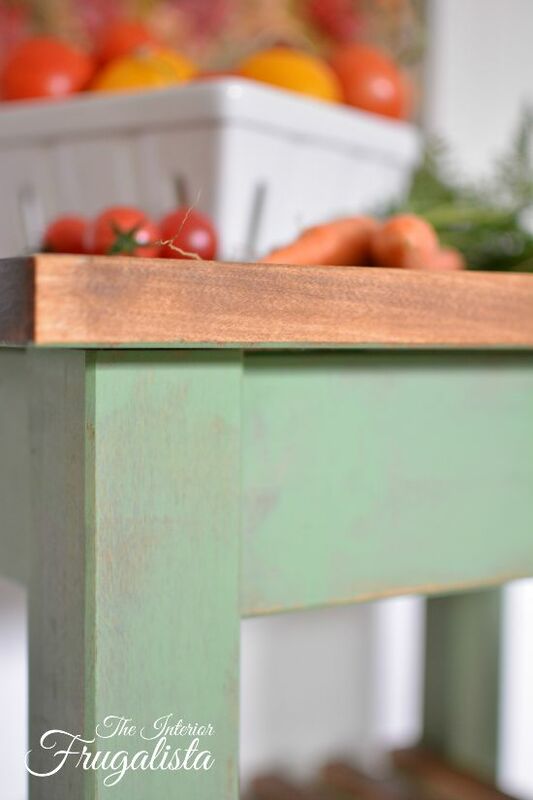 I'm quite pleased with how much farmhouse charm was added to this simple IKEA Bekvam cart with one coat of paint and food safe oil. The sign hanging above the cart was made with a thrift store picture frame and dollar store leaves and super easy to make. 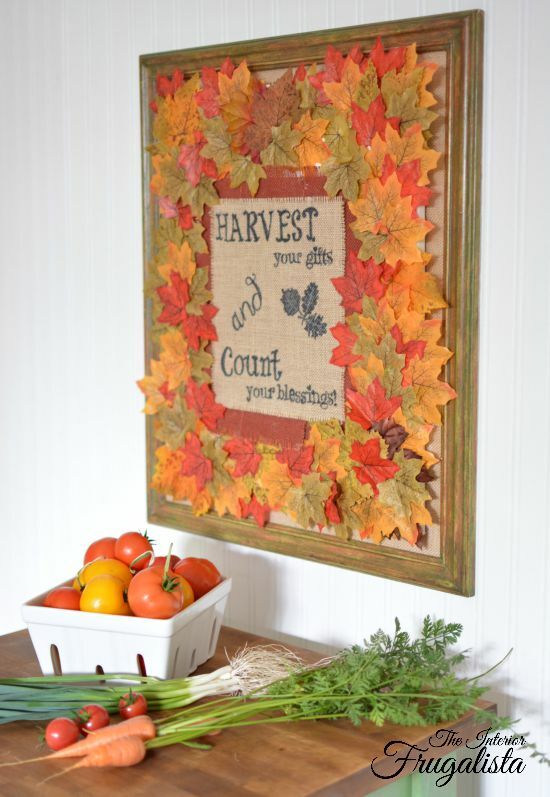 You can find the tutorial here in my post Fall Harvest Sign. 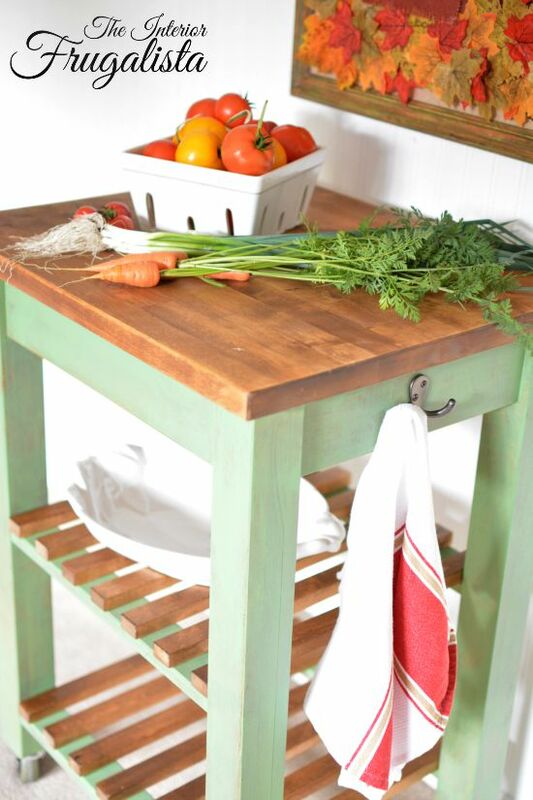 I hope I've inspired you to add some farmhouse charm to a simple portable IKEA Bekvam Cart. Now I have a date with my crockpot! Here are some more IKEA Hacks that I've done over the years starting with another Portable Multi-Purpose Cart that I'm using in my home office. I also repurposed an IKEA Moppe into an Apothecary Cabinet where we keep our CD collection. For my grandson's nursery, I repurposed an IKEA Tarva into a Nursery Change Table. If you found this tutorial helpful and inspiring, please share it with a friend and/or save it on Pinterest. My projects are shared at these LINK PARTIES.